An often-contentious year of negotiations has produced an agreement between Minneapolis police and community members that participants say could reduce tensions that now exist. The federally mediated deal calls for police to be more aware of race and mental health issues, and would create a new panel to oversee compliance of the agreement. Minneapolis, Minn. — All of the participants say the process to reach agreement was contentious. As recently as this week, the sides deadlocked when they couldn't agree on final language. Rev. Ian Bethel, part of the community team selected mainly from minority groups, says the deadlock broke after all the participants stopped to pray. Bethel says such moments were key to reaching consensus. The call for federal mediation came after a series of highly charged racial incidents in the summer of 2002. Events culminated with a riot in north Minneapolis after an officer conducting a drug raid inadvertantly wounded a young boy while shooting at a charging dog. Police Chief Robert Olson delayed the start of mediation because the original community negotiating team did not include established minority organizations such as the NAACP. Patricia Glenn, the mediator from the Department of Justice, says the process is as important as the outcome. "Certainly as a mediator I always want to get a written agreement," Glenn said. But also what I want to see happen is relationships change. That people aren't the same people they were seven months ago when we began this very tedious process sometimes very contentious process." Police Chief Olson says the effort was eye-opening for him and the other officers involved: "For us, and we also saw it with them, is we really began to look at community issues through the community eyes. Through the eyes of the everyday people out there doing everyday things in life to get by and have a living. And we really did -- we changed." The document calls for a 30-member Police Community Relations Council. Eighteen of the members will be selected by the community mediation team. The panel will be responsible for making sure both sides maintain the agreement. The agreement requires new training for officers, requires expanded use of non-lethal weapons and sets the goal of making the Minneapolis police department one of the top five deparments of it's size in the nation for hiring diversity. The agreement expires in five years, but can be renewed if the parties agree. Olson says it's a solid document that lays a foundation for better relations. 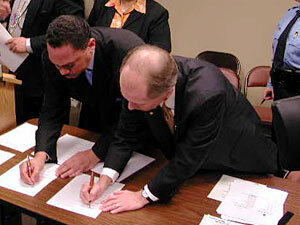 Both sides agreed making the mediation work remains a difficult task. The community team's Ian Bethel urged the police union, which he says has significant sway with Minneapolis elected officials, to respect the outcome. "We want to say -- as we've come to these crossroads -- to the federation and also in particular the line officers," he said. "This agreement must not be tampered with or watered down by politics as usual or fraternal indignation." Police Federation President John Delmonico says the agreement is fair and sets up a method for measuring progress over time. At one point Delmonico and longtime community activist Spike Moss embraced in a somewhat tongue-in-cheek reference to the day's spirit of cooperation. Like most elected officials Mayor R.T. Rybak did not have a role in creating the agreement. City officials are in the process of selecting a new police chief because Rybak refused to reappoint Olson. Rybak says the agreement fits with his efforts to improve relations, but he says it will be hard to accomplish. "I really have to say the most important issue about our skin over the next couple of months will not be what color it is but how thick it is," Rybak said. The agreement must be approved by the full city council. Their next meeting is next Friday.